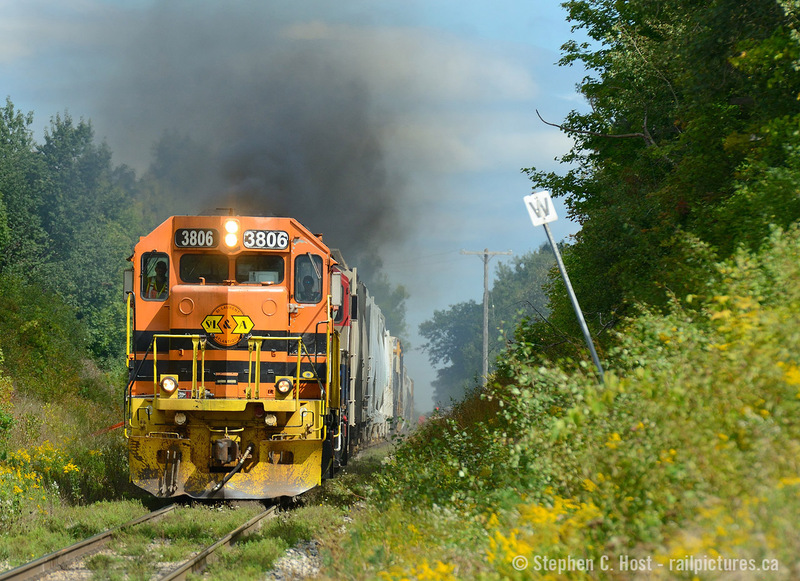 Railpictures.ca - Stephen C. Host Photo: Hammer down: Engr. Snook has SLA 3806 firmly in his control as the boys head back to Kitchener making every effort to get up to the mile a minute track speed of the Guelph subdivision. And boy do they ever succeed in the straightaway between Hanlon and Breslau: The action here is always nothing short of awesome. Hats off to the GEXR boys who continue to run a great show and display some great railroading in 2018. Not many places you can find a former GP40X (Now classed GP40-3) in service.. | Railpictures.ca – Canadian Railway Photography – photographie ferroviaire Canadienne. Copyright Notice: This image ©Stephen C. Host all rights reserved. Caption: Hammer down: Engr. Snook has SLA 3806 firmly in his control as the boys head back to Kitchener making every effort to get up to the mile a minute track speed of the Guelph subdivision. And boy do they ever succeed in the straightaway between Hanlon and Breslau: The action here is always nothing short of awesome. Hats off to the GEXR boys who continue to run a great show and display some great railroading in 2018. Not many places you can find a former GP40X (Now classed GP40-3) in service.. Sorry, there is no map for this photo. Photographer did not add GPS co-ordinates. Please add next time or ask for a correction to this photo. I re-thought how to best describe this, and I came up with the term “give ‘er exeter railway” track speed, notch 8 awesomeness. That engineer hit the smoke button! Sweet lunch time shot Steve. Snake does not get an “elasticized” lunch hour like you or R Smith do. Of course. 580 regularly goes back to kitchener at lunchtime. Great ! were you out on your …lunch…again ?